A page from the manuscript that Alaric Hunt and his editor passed back and forth. Just before Labor Day in 2011, Toni Kirkpatrick, an editor at Thomas Dunne Books, an imprint of St. Martin’s Press, picked up her phone and called an unfamiliar number with a Southern California area code. She was hoping to deliver good news to a man named Alaric Hunt, the newest winner of a debut-detective-novel writing contest, jointly sponsored by Minotaur Books (another St. Martin’s imprint) and the Private Eye Writers of America. The contest has a good track record — a past winner, Michael Koryta, a 21-year-old phenom, has since published 10 successful thrillers — and it also comes with a substantial prize: a $10,000 advance and a guaranteed publishing contract for the book that has been submitted. Alaric Hunt’s novel appeared last year to mixed reviews, but his publisher hopes for further installments. Beyond that, though, all either of them knew about Alaric Hunt was that he had submitted a manuscript along with a Southern California phone number. So when a woman answered the phone, Kirkpatrick asked if she could speak to Alaric. The woman on the phone was Hunt’s first cousin, Jade Reed. She had mailed the manuscript to Minotaur on his behalf. “Like a prison?” Kirkpatrick asked. Before this phone call, it had never occurred to Kirkpatrick that her contest winner might have spent the past 25 years in prison, where he’s serving a life sentence for murder. Alaric Hunt turned 44 in September. He last saw the outside world at 19. He works every day at the prison library in a maximum-security facility in Bishopville, S.C., passing out the same five magazines and newspapers to the same inmates who chose the library over some other activity. He discovered his favorite writer, Hemingway, at a library like this one, in a different prison. He found the Greek and the Roman philosophers there too. He rediscovered the science-fiction masters who wowed him as a boy and spurred him to write his own stories. And, one Friday three years ago, he found the listing for the contest that would change his life. Before he entered the Minotaur contest, Hunt wrote short stories but had no luck in publishing them. He had never written a private-eye tale before. He stopped submitting stories altogether in 2001, because he ran out of money for postage. But then he stumbled across a 2007 edition of Writer’s Market, listing Minotaur’s contest for the best unpublished private-detective novel. There was no entry fee, and the prize money was enticing. He could pay off debts. He could buy his older brother a television set. The contest could mean a different way forward for him. He took five months to write the first draft of his book, titled “Cuts Through Bone,” in longhand (and another four months for a rewrite), carving out bits of writing time between the morning, noon and night counts. He sketched out a story set in New York City, a place he had never visited, and he dreamed up an odd-couple dynamic between Rachel Vasquez, a street-smart teenage operative working for a middle-aged, middle-class detective named Clayton Guthrie. The manuscript’s main case centers on the murder of a college woman whose boyfriend, a veteran of the war in Afghanistan, is wrongfully accused of the crime. 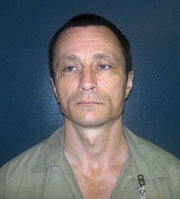 A 2013 prison photo of Hunt, who is serving a minimum of 30 years. He assembled the other elements of his novel from piecemeal glances of the outside world. He took cues for his version of New York, for example, from “Law and Order” episodes; a photocopy of a 1916 map of the boroughs; Berenice Abbott’s “Changing New York”; and novels he read set in the city. For research on detective fiction, he read “The Long Goodbye,” by Raymond Chandler, as well as some crime novels by Ed McBain. He later told me he considers Michael Connelly to be the “best crime writer working today.” He discovered and read “The Maltese Falcon,” by Dashiell Hammett, only last year. The last time Hunt had a visitor in prison was in 2006, when his aunt and her oldest daughter flew from their homes in San Diego to see him. He was clean-shaven then, his face hardened by so many years inside. For much of the past year, he sported a large, bushy mustache that drew attention away from hawkish cheekbones and hooded hazel eyes, but he shaved it off for his most recent prison photo. Hunt has been incarcerated since 1988 for murder, arson, robbery and other charges. He won’t be eligible for parole for five more years. South Carolina makes it exceedingly difficult for outsiders to visit inmates in the state’s prison system. Only friends and relatives who knew the inmate before his or her incarceration are approved for visitation. Face-to-face interviews by journalists and taking photographs of inmates are no longer permitted, according to the state corrections-department website, “so as not to glamorize the crimes of the offenders, and not to revictimize the victims and their family members.” In addition, South Carolina has one of the most dangerous prison systems in the country, rife with riots and in dire need of renovations that an underfinanced state budget cannot afford. When I first contacted Hunt by mail last spring, his reply warned that he is “constitutionally sour, rarely [having] a good thing to say about anything.” Even his fellow inmates, he told me, consider him abrasive. But he likes writing and receiving mail. His subsequent letters to me often stretched to several thousand words. His correspondence often blistered with bitter, caustic humor. “Coming square up against the wall of talking about myself gives me the sick feeling of offering a weighty pronouncement by the jailhouse philosopher.” On the phone, he answered questions in a Southern-inflected baritone, but he preferred the pen, he told me. He had more time to deliberate. One wrong move, one ill-considered statement could set him back another decade. 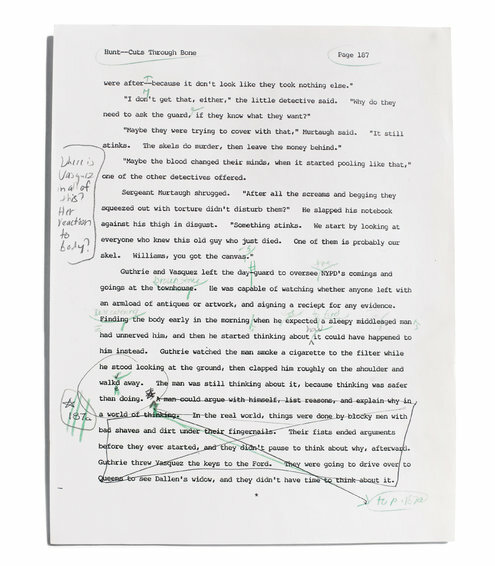 Kirkpatrick did wonder initially how Hunt, cut off from a writer’s usual resources, would be able to respond to edits on his manuscript. Prison rules and regulations, along with mailing delays, made an already lengthy publishing process more fraught over the course of the next two years. Hunt and Kirkpatrick worked together by letter, trading edits off a single copy of the manuscript. That same copy was later marked up further by the book’s copy editors, so one page could have three people’s handwriting on it. Despite these difficulties, Minotaur felt the book was ready for publication by the production deadline. 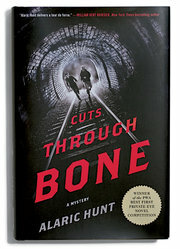 They released “Cuts Through Bone” in May to a mixed but muted response; Kirkus Reviews praised it as a “down and dirty debut” while Publishers Weekly criticized it for having an “unremarkable plot” and “overblown prose.” Kirkpatrick said she held out hope that there would be more Vasquez and Guthrie books from Hunt. It’s true that the finished version of “Cuts Through Bone” adheres to certain private-detective conventions. A young woman walks through the door with a tantalizing case, and Chandler-esque metaphors dot the narrative (“elderly buildings holding aristocratic chins”). The word “fedora” is mentioned more than a dozen times. The crimes in “Cuts Through Bone” bear no resemblance to the ones that landed Hunt a life sentence, but when you compare the story he has lived with the one he has written, there are clearly some resonances, particularly around the theme of troubled sibling relationships. Hunt has a brother, Jason, who is 13 months older than Alaric and also in prison. As boys, Alaric, smaller and more fine-boned, found refuge in reading, writing, drawing and playing Dungeons and Dragons, while the taller, burlier Jason preferred music, playing acoustic and electric guitar. Not long after graduating from high school, Alaric tested at an I.Q. of 137. Jason dropped out in the 10th grade. They led troubled lives. Their mother, Bonnie, divorced their father when the boys were toddlers. She was four months into her third marriage when in December 1983 she died in a head-on collision, and her death ended years of her physical and emotional abuse. She once beat Alaric with a baseball bat. She inflicted worse damage on Jason. “My mother taught me there was no such thing as mercy,” Alaric told me. They stayed with their new stepfather in Kentucky to finish school, but, according to Alaric, his form of parenting involved supplying the boys with drugs and draining their inheritance, worth at least six figures from insurance money paid out after their mother’s death. Eventually reunited with their biological father, the brothers worked construction jobs around South Carolina. One of them was on Cochran Road, about two miles north of Clemson University. When Richard Hunt kicked his sons out of his trailer in early 1988, according to court records, Jason grew increasingly angry. He wanted to go to music school in Southern California but had saved only $1,400. Alaric would do anything to help his brother. Even if it ended up destroying three lives. Their target was Clemson Jewelers on College Avenue, just up the street from the university. They thought that if they set fires to two places two miles away on either side of the jewelers, the police and firefighters would be so busy with the blazes that they wouldn’t notice if a couple of guys broke in and made off with “some highly valuable diamonds that two hillbilly ignoramuses decided would be handy, portable and salable,” as Alaric describes it. So around 2 a.m. on Memorial Day in 1988, the brothers parked a few feet away from a 12-unit apartment building on Cochran Road called Forest Hills. Jason spread a can’s worth of gasoline around the outside, lit a match and sprinted back to the dark Nissan truck, where Alaric waited. Their next stop was the Fort Hill Mansion, one of the original Clemson buildings. The fire there curdled paintings, singed the wallpaper, ruined a grand piano and permanently grafted table lace onto a coffee table. Only an out-of-date sprinkler system saved the landmark mansion from burning to the ground. As they predicted, their robbery slipped past the attention of law enforcement while both blazes burned. Firefighters needed three hours to put out the flames and rescue 15 summer students from the gutted apartment building. Less than 12 hours later, the body of Joyce Austin, a 23-year-old Clemson graduate student, was found in what remained of Forest Hills. She died of smoke inhalation, unable to escape because a section of drywall fell on top of her as the fire raged. On July 14, the police arrested Alaric and Jason for Joyce Austin’s murder, and for robbery, conspiracy and several counts of arson. The “high-quality diamonds” they took turned out to be women’s rings worth $200 in total. The legal system worked fast. The prosecutor announced he would seek the death penalty. Jason’s trial was set for Oct. 10. Alaric’s was never scheduled. On Oct. 11, they pleaded guilty to all charges. The judge sentenced them both to life in prison with no parole for at least 30 years. At the time of the verdict, Alaric’s lawyer characterized the long imprisonment as a good outcome: “Lawyers always want to win. In a case where the stakes are death, and your client is alive, I believe you’ve won.” Alaric and Jason served seven years of their prison terms together, but were separated in 2003, after Jason was accused of trying to escape. Now more than a hundred miles apart, the brothers communicate sporadically by letter, a privilege reinstated just last year. 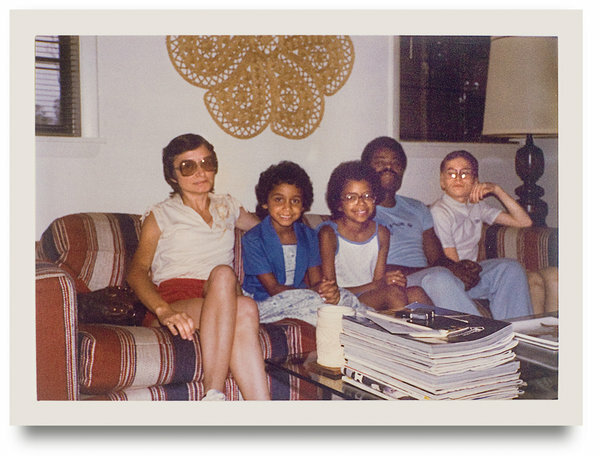 An earlier version of a picture caption with this article misstated the relationship between the two adults shown with Alaric Hunt and his cousins. Janice Hill, his aunt, is pictured with her husband; he is not her former husband.